David Levy's reputation as a Comet and Asteroid Hunter needs little introduction in Astronomical circles: he has discovered 22 Comets and 41 Asteroids, many with the use of his beloved Minerva - a 6-inch f/4 Newtonian Reflector. Levy had mused that had he the opportunity to redesign the instrument that he'd opt for closer to an f/5 system, in order to improve off-axis star images. 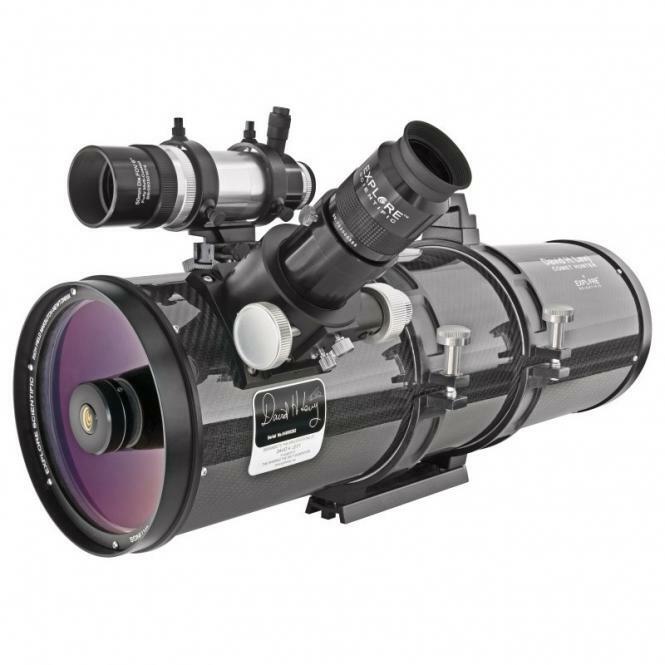 Explore Scientific decided to join forces with the veteran observer and help him develop this completely new instrument - the Explore Scientific David H Levy Comet Hunter 152mm Carbon Fibre Maksutov Newtonian. Plumping for an f/4.8 design, this instrument is capable of delivering huge fields of view - 2 degrees or more of the night sky. At such a short focal length, it lends itself particularly well to widefield astrophotography. The Comet Hunter is constructed using thermally inert and extremely robust - yet very light - carbon fibre. The whole telescope weighs in at around 8kg, and being so light, puts very little strain on mounts compared to other instruments of similar aperture. The tube is heavily baffled and internally blackened, offering fantastic contrast and a 2" graduated 10:1 Crayford focuser comes as standard. The Comet Hunter also comes with a brilliant 8x50 erect image illuminated finder, two seats for the finder or additional piggybacked accessories, extension tubes. Sky and Telescope's Dennis de Cicco wrote in his review of the instrument, "I found a lot to like about the David H Levy Comet Hunter… the scope offers first-class performance for observers and astrophotographers. And I'm particularly impressed with its quality of construction." A percentage of the profit from the sale of the Explore Scientific David H Levy Comet Hunter goes directly to David's own Sharing the Sky Foundation, a not-for-profit outreach organisation dedicated to Astronomy. A great technical telescope with an ethical edge too! 37.5" x 19.5" x 16"